To avoid catastrophic climate change, we must remove carbon already in the atmosphere: reducing emissions, while necessary, does not suffice. Kyoto Protocol Carbon Market architect has a message for Paris. Delegates gathering on the first day of the COP21 Climate conference in Paris. Demotix/ Francois Pauletto. All rights reserved. But things are not that simple. Aside from the obvious problem that needs to be overcome, which is reaching a general consensus on an effective strategy for reducing emissions, one must ask whether a cap and trade strategy is sufficient at this point in averting a climate catastrophe. Graciela Chichilnsky thinks that capping emissions is not enough. She believes instead that new, innovative technologies are already in place to allow us to actually capture carbon dioxide and thus remove permanently the threat of a catastrophic climate scenario due to global warming. C. J. Polychroniou: Graciela, you designed, created and wrote the Kyoto Protocol Carbon Market. What has been the impact of the Kyoto Protocol in the fight against climate change? Graciela Chichilinsky: The Kyoto Protocol Carbon Market had a very positive impact, measured by its significant reduction of emissions since the Protocol became international law in 2005: indeed, the nations that participated in the KP carbon market reduced their emissions by about 27%, while all other nations, sharply increased their emissions in that period. At the same time, since becoming international law, the trading in the carbon market went up to $175Bn/year by 2011. Furthermore the Clean Development Mechanism (CDM) of the carbon market transferred to developing nations an unprecedented $170Bn in transfers for clean development projects. One of those projects was the Chinese solar technology that decreased the cost of PV energy by a record $70% during this period, making China the largest exporter of clean power machinery in the world. Chinese solar technology decreased the cost of PV energy by a record $70% during this period, making China the largest exporter of clean power machinery in the world. Kyoto succeeded by providing powerful commercial incentives and changed the value system in the Kyoto Nations by providing a “price for carbon” which even the largest gas and oil companies in the world (BP, Shell Total, Statoil) are now supporting and endorsing to the UN as a necessary policy to combat climate change. CJP: Why has the US refused to ratify the Kyoto Protocol and what have been the consequences of this refusal? GC: The explanation is documented in US congressional records: in July 15, 1997 the US Senate voted in unanimously, 95 to 0, the Byrd-Hagel Act requiring that before the US would accept mandatory emission limits (1) the developing nations should accept mandatory limits themselves and (2) the limits should be shown not to produce damage to the US economy. At the time, the Kyoto Protocol excepted the developing nations from mandatory limits contradicting the Byrd Hagel Act. Furthermore over 90% of energy power plants was driven fossil fuels, so that economic development would be negatively impacted by reducing emissions from fossil fuels, again contradicting the Byrd Hagel Act. The consequence of the US refusal was that the Kyoto Protocol when signed in December 1997 did not limit the emissions of the world’s largest emitter, which was responsible at the time for about 25% of the world’s emissions. The Kyoto Protocol was seen by the US as favoring the developing nations since it had no emissions limits for poor nations. However, at the time poor nations contributed very little to global emissions, so this was not an important issue. Despite the US refusal, nations representing 55% of the emissions – Russia being the critical vote - voted to ratify the Kyoto Protocol in 2005. Despite the US refusal, nations representing 55% of the emissions – Russia being the critical vote - voted to ratify the Kyoto Protocol in 2005, and the Protocol and the carbon market that I designed and wrote into it, became international law. 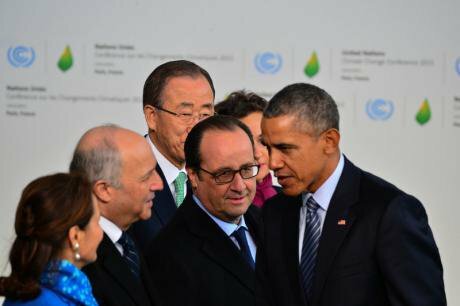 This started a period of confrontation between the US and the UN Kyoto Protocol that continues to this day: two weeks ago, US Secretary of State John Kerry stated publicly that “nothing legal would be agreed in Paris COP21” – meaning nothing mandatory, presumably – a statement that was contradicted in the international media by President Hollande of France. In my view, the two conditions of the Byrd Hagel Act can be satisfied today and the US can turn into a world leader of the Kyoto Process - or Kyoto by any other name - using US “carbon negative” technology that overcomes the second objection of Byrd Hagel, and modifying the notion of mandatory emissions to include the Green Power Fund that I proposed in Copenhagen COP 15, December 2009, thus overcoming the first objection of Byrd Hagel. I am working hard, and look forward to trying to make this happen and hope we will succeed. CJP: Certain leaders of developing nations are leery of all talk about climate change and prefer to speak, instead, of “climate justice.” This was certainly the message delivered by India’s PM Modi during the opening day of the Paris UN conference on climate change. Countries like India are indeed concerned that putting limits on emissions will hinder their development prospects when rich nations managed to avoid this dilemma by being historically, but also in the present, the major polluters. Is there a convincing argument against this stance? In my view, the two conditions of the Byrd Hagel Act can be satisfied today and the US can turn into a world leader of the Kyoto Process - or Kyoto by any other name. GC: Well, PM Modi’s argument about climate justice is valid, but he is wrong to think there is a tragic trade off between overcoming poverty through economic development and a stable climate. There used to be such a trade off 10-20 years ago--but no longer. CJP: You mean to say there are actually technologies available to assist us in the titanic struggle for the future of the planet without compromising growth? GC: Yes, exactly. I created Global Thermostat in 2010 precisely to assist the titanic struggle for the future of the planet. The Kyoto Protocol and its carbon market created the economic structure to solve the problem, but we also needed technology to physically clean the planet’s atmosphere and provide energy to the nations of the world. This is why I founded Global Thermostat, a company that is now in a commercial stage, and created a technology conceptualized and patented with Dr. Peter Eisenberger, that removes CO2 directly from air. Our proven technology removes CO2 at such a low cost that the CO2 thus produced can be sold at a profit for food, beverages, fertilizers, building materials, synthetic fuels, etc. The market for CO2 on earth is huge, exceeding $1trillion/year, and it can absorb all the CO2 we need to remove from the atmosphere to avert catastrophic climate change – this is now a necessity according to the 2013 IPCC Fifth Assessment Report p. 191. CJP: How far developed is Global Thermostat? I created Global Thermostat in 2010 precisely to assist the titanic struggle for the future of the planet. GC: Global Thermostat has already built two commercial-size plants that are operating at SRI (formerly Stanford Research Institute) at 333 Ravenswood Ave Menlo Park California, the most famous technology development campus in Silicon Valley, where the first internet communication experiments were conducted. In April of this year, Global Thermostat was selected as the “World Top Ten Most Innovative Company” by Silicon Valley’s Magazine Fast Company, and I was selected by IAIR at the Yale Club of New York the “2015 CEO of the Year”. CJP: How do conventional technologies that capture carbon dioxide differ from carbon negative technology such as the one employed by GT plants? GC: There are many differences. It is a new generation and totally different technology and business proposition. The main difference is that GT technology removes CO2 directly from pure air: it does not require a power plant or any other stationary source of CO2. This is critical because it eliminates transportation through pipelines or trucks, which are extremely costly and potentially dangerous. Removing CO2 from air means that GT technology is a “carbon negative technology ™” - a term I introduced and trademarked in Copenhagen--so that after using it, the atmosphere is cleaner in net terms than before. All other traditional forms of carbon capture that take CO2 from chimneys are NOT carbon negative – they are at most carbon neutral. Why is this important? Because the IPCC has now documented that to avoid catastrophic climate change we must remove the carbon that is already in the atmosphere – and reducing emissions, while necessary does not suffice. GC: The unique characteristic of our technology is that it makes it profitable to remove CO2 from the air, and sell it for food and beverages, McDonald and Coca Cola; building materials such as concrete and cement, as is done by CarbonCure; water desalination, as in our most recent commercial project in Israel. This means that cleaning the atmosphere and averting climate change is rewarded by profits if one uses GT technology. So we need only risk capital and investment as does any other new company in Silicon Valley; the company makes money. So far our company has raised $29MM and in a couple of years we can become a public company. The carbon market of the Kyoto Protocol and its CDM – and the Green Power Fund that I created - moves the needle and leads to the rapid expansion of carbon negative power plants that is crucially needed now. CJP: Are you optimistic about the outcome of the Paris climate change talks? GC: No, I am not, because the problems are complex and existing politicians are not able to raise above the Byrd-Hagel concerns. We need to move in this direction and implement it as soon as possible to prevent the extinction of humankind. They do not understand that there are solutions now. For example, with GT’s or similar technologies, which can now build carbon negative power plants and thus overcome the second obstacle of Byrd-Hagel, one can have a clean atmosphere, a safe climate, and economic development all at the same time. With respect to the first obstacle in the Byrd Hagel Act, we need to define carbon emission limits for poor nations a bit differently. Carbon emission limits are very important indeed, and crucial to the working of the carbon market. Without those limits there is no carbon market. For a poor nation we can require that the mandatory limits are those that can be achieved with carbo-negative power plants that are built with the CDM funding of the Green Power Fund. Developing nations can be paid to build plants that produce development and clean the atmosphere. And even PM Modi would agree with my new notion of mandatory limits once he understands the technology that is available today. The funding is there in the carbon market. The institutions such as the Kyoto Protocol carbon emissions limits are there. And the technology is there. This is a political, financial and technological solution that works. We need to move in this direction and implement it as soon as possible to prevent the extinction of humankind.